Worked design area is six inch square, the fabric is white. You might note I removed the glass that came with the frame. I used a 10 inch by 8 inch black plastic frame with a double mat, the inner mat is gold and outer mat is cream. 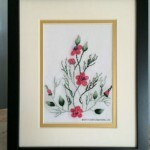 If you are familiar with the design you will note I did not add the pink French knots on the thinner branches. I used the supplied Edmar rayon thread, adding a variegated rosy-pink Edmar Lola thread (petal bullions) and a variegated light-dark green Edmar Lola thread (leaves) that I had on hand. 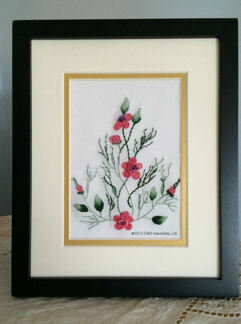 I also added colonial knots (pink in color) into the areas defined by the pink bullion stitched petals.